The blog post below is a complete lesson plan based around the image 'Marry me'. The blog post below is a complete lesson plan based around the image 'Marry me'. It is designed to be used with teenage and adult learners who have a CEF level B1 and above. Put students in groups of three and tell students that they have two minutes to describe the photo. If they don’t know a word, tell them to note it down in their own language and ask at the end. Stop them after two minutes and answer vocabulary questions. Now tell them that they have five minutes to tell the story behind the photo and what happened next. When the time’s up, get them to tell the rest of the class their story and vote on the most imaginative, romantic etc. 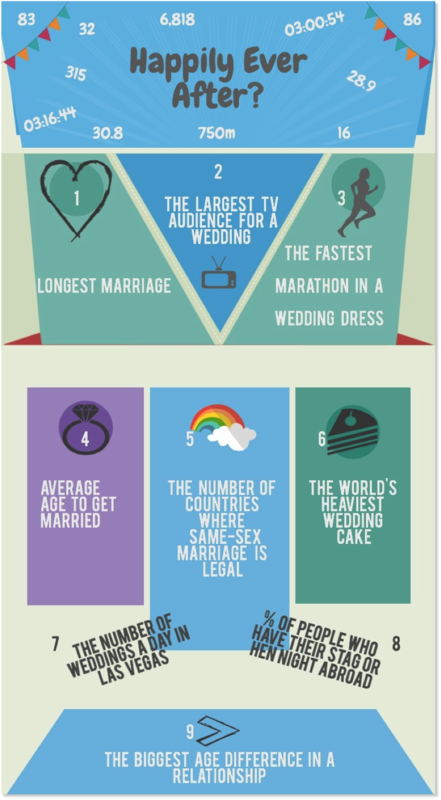 Tell students that they’re going to see some marriage-related facts and figures and display the infographic below. Ask students to match the figures in the box at the top that says 'Happily ever after' with the facts below. Point out that there are nine facts and eleven figures. Two of the facts need two numbers each - one for men and one for women. The longest marriage was between Herbert Fisher and Zelmyra Fisher, an Ame-rican couple who were married for 86 years, 9 months and 16 days until Herbert Fisher’s death on 27 February 2011. The wedding of Prince Charles to Lady Diana Spencer in July 1981 attracted the largest TV audience - an estimated 750 million viewers in 74 coun-tries. The fastest marathon by a woman in a wedding dress was 3hr 16 minutes 44 seconds and by a man 3 hours 54 seconds. Ask students why they think people might do this (to raise money for charity). The average age to get married in the UK is 30.8 years old for men and 28.9 for women. Ask students if they think it’s similar in their country. The world’s heaviest wedding cake weighed 6,818 tonnes and was made in Connecticut, USA on 8 February 2004. There are 315 weddings a day in Las Vegas. 32% of people from the UK have their stag or hen night abroad. The biggest age difference in a relationship is 83 years. In November 2006 Sudar Marto, 105, of Malaysia married Ely Maryulianti Rahmat, aged 22. Display the first image again and tell students to work with the same people as in steps 2 and 3. They should retell their story incorporating the vocabulary that has come up in class. To finish off, regroup them so that they are with a different partner and they tell their new version of the story. The listener awards a point for every item of wed-ding-related vocabulary the speaker uses. As a follow-up, ask them to bring a wedding photo to the next class and talk about it with a partner.